Bread Makers - View our range of Bread Makers here at Anthony Ryans cookware shop, offering excellent quality Bread Makers to suit your needs. An electric bread maker will give you a perfect loaf every time, and they will fill your house with gorgeously edible bread smells. But how does it do it? 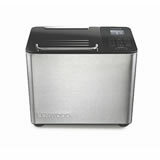 A bread maker is essentially a compact electric oven that holds your bread tin. The tin is a bit special, it is connected to an electric motor underneath that provides all the power for the working process. One of the first things you'll hear is the machine's motor whirling around as the paddle spins kneading the dough. Then quite for the rising phase. Again more kneading and another period of quiet during the proving. Finally, the oven will switch on, steam will rise, and you'll start to smell the delicious aroma of baking bread a few minutes later. The basic bread making process is largely automatic, but most machines come with recipe books for making more advanced types of dough.